Wonderful artist Hajime Yamamoto made me another drawing. He also made a book you can buy here. The book is his first with these drawings, but I know he’s working on another already! 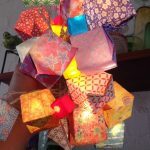 Shipping off another origami string of lights, made from Japanese origami paper. This one turned out really good. May it shine for a long time in the receivers home. Available in my Etsy shop.